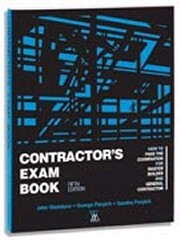 The Contractor's Exam Book, 5th Edition has major updates for current and future contractor exams! The purpose of this Fifth Edition of the Contractor's Exam Book: How to Pass the Examination For Master Builder & General Contractor is to help candidates successfully prepare for and pass the examination for Certified General, Builder, and Residential Contractor. Since the appearance of the First Edition in 1971, the need for this book has increased tremendously. Many thousands of candidates have applied for contractor licenses in the construction industry as more states and municipalities have written contracting license examinations into their law books. Contractor licensing has itself become a "growth industry." Many colleges and universities now offer degrees in building and construction science. License fees and renewal fees have become a continuing source of revenue. In some states, continuing education credits are required for licensed contractors.